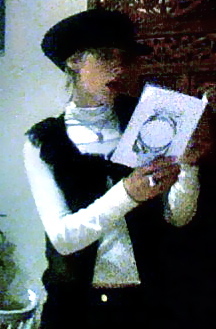 Note the reading material : THE ALL NEW BOOK CLUB BOUTIQUE ANTHOLOGY, featuring some really good writing, and myself. Available at the Book Club Boutique in London, or at festivals over the summer. Let me know if you’d like a copy and I will attempt to arrange it. The Book Club Boutique is the foremost literary night in London, run by my old swordswordwoman, Salena Godden. Hat, Miss Jones by Stephen Jones. Goth lace collared chiffon top, Alexander McQueen. White ski top, Scarlett Johansen for Reebok. Black jeans, as per the past two days – and still with a little stretch, ace. I crippled by toes by failing to put on socks with my six inch heels, I was in such a hurry to leave the house in Louise Bourgeois-esque legs, RIP. ← Hang 10…working, on a Bank Holiday?